58131 SPE TONGA (1984) Dascyllus aruanus*. Self-adhesive stamp overprinted SPECIMEN. Scott No O61, Yvert No SE63. 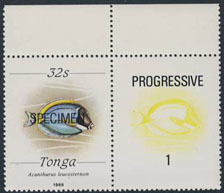 58132 SPE TONGA (1984) Acanthurus leucosternon*. Self-adhesive stamp overprinted SPECIMEN. Scott No O63, Yvert No SE64. 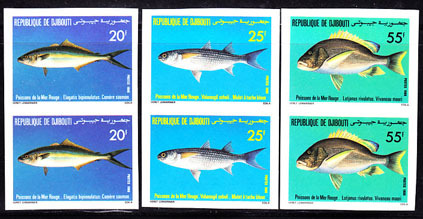 72340 ND DJIBOUTI (1986) Fish*. Set of three imperforate pairs. Fish of the Red Sea. Scott Nos 616-8, Yvert Nos 622-4. 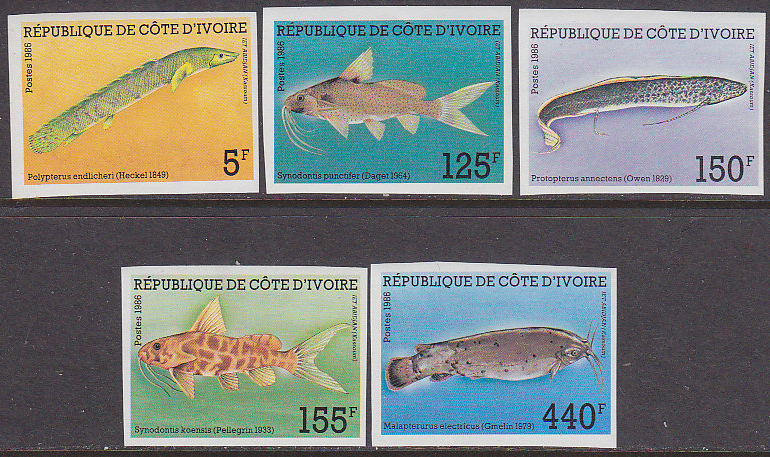 75172 ND IVORY COAST (1986) Fish*. Set of 5 imperforates. Scott Nos 794-8. 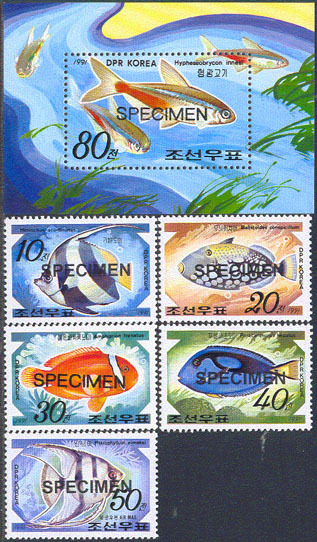 67775 SPE NORTH KOREA (1986) Gift fish. Set of 2 specimens. Scott Nos 2555-6, KSC Nos 2595-6. 49050 SPE NORTH KOREA (1986) Gift fish*. Set of 2 overprinted SPECIMEN. KSC Nos 2595-6. Scott Nos 2555-6. 66011 ND PAPUA NEW GUINEA (1987) White-cap anemonefish*. Imperforate pair. Scott No 659, Yvert No 534. 39756 ND NICARAGUA (1987a) Atlantic tarpon*. Imperforate. Scott No 1661, Yvert No 1474. Tarpon atlanticus. 39759 ND NICARAGUA (1987d) Banded astyanax*. Imperforate. Scott No 1664, Yvert No PA1205. Astyanax fasciatus. 39761 ND NICARAGUA (1987f) Green wolf cichlid*. Imperforate. Scott No 1666, Yvert No PA1207. Cichlasoma dovi. 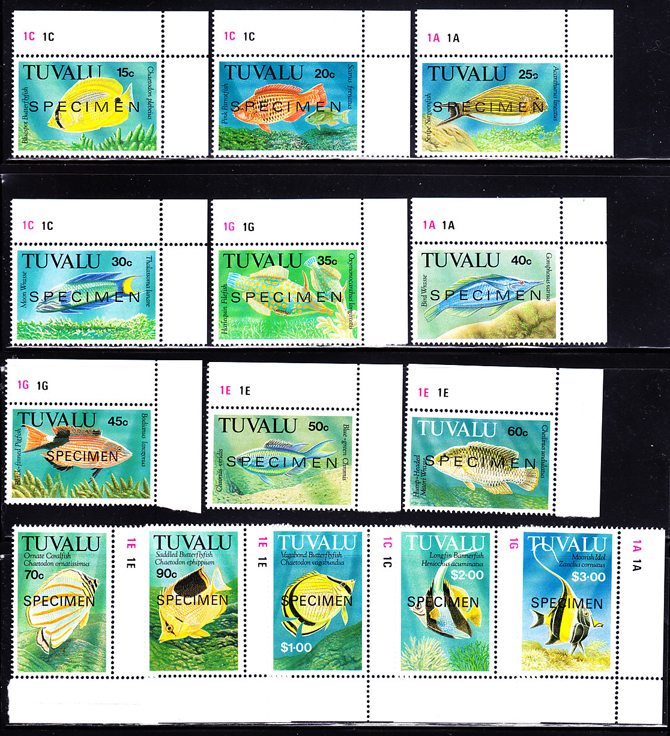 58139 SPE TONGA (1988) Dascyllus aruanus*. Specimen with progressive proof. Scott No 688, Yvert No 703. 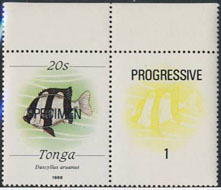 58140 SPE TONGA (1988) Acanthurus leucosternon*. Specimen with progressive proof. Scott No 689, Yvert No 704. 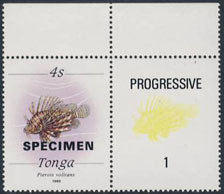 58144 SPE TONGA (1989) Pterois volitans*. Specimen with progressive proof. Scott No 701, Yvert No 721. 49113 SPE NORTH KOREA (1990) Fish*. Ray*. Set of 5 overprinted SPECIMEN. KSC Nos 3028-32. Scott Nos 2951-5. 58269 MAX F.S.A.T. 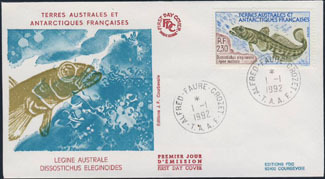 (1991) Champrocephalus gunnari*. Maximum card. Scott No 164, Yvert No 161. 67901 SPE NORTH KOREA (1991) Tropical fish. Set of 5 specimens. Scott Nos 3032-6, KSC Nos 3118-22. 49124 SPE NORTH KOREA (1991) Fish*. Set of 5 + S/S overprinted SPECIMEN. KSC Nos 3118-23. Scott Nos 3032-7. 58274 MAX F.S.A.T. 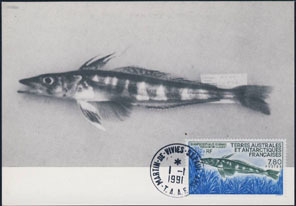 (1992) Dissostichus eleginoides*. Maximum card. Scott No 168, Yvert No 166. 58192 FDC F.S.A.T. 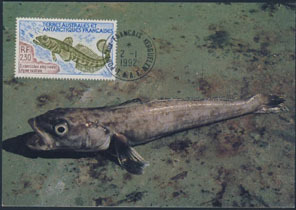 (1992) Dissostichus elegenoides*. FDC with cachet. Scott No 168, Yvert No 166. 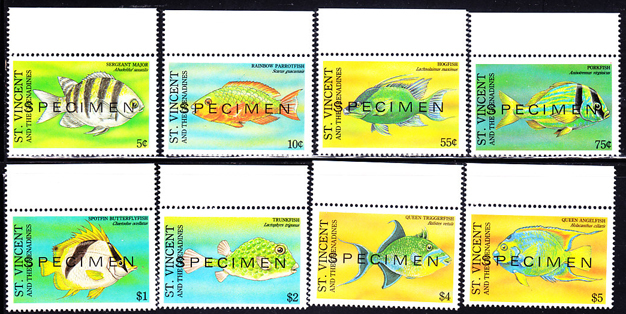 68552 SPE ST. VINCENT (1993) Tropical fish*. Set of 8 overprinted SPECIMEN. Scott Nos 1808-15.